This article is via the TheEnvironmentalBlog.com, originally posted May 22nd, 2018. It is highly encouraged to visit their website for information about sustainability, zero waste, and the environment. Also, the original post can be viewed here! 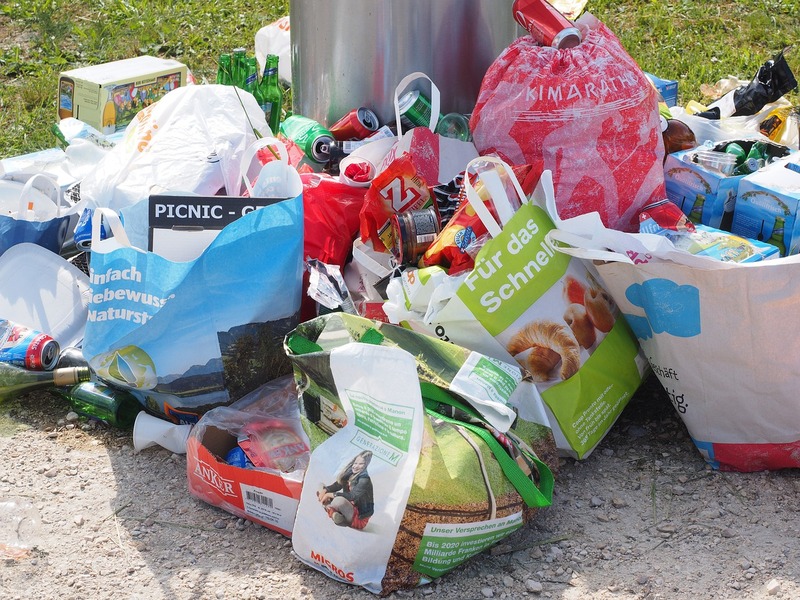 Food packaging waste is a serious environmental issue. Much of the plastic produced in the world comes from disposable food packaging taking the form of coffee mugs, lunch boxes, bags, wraps, containers, and disposable plastic cutlery. Sadly, an increasing number of people are using plastic packaging for the sake of convenience. If present trends continue, by 2050, there will be 12 billion metric tons of plastic in the world. Much of this plastic will end up in landfills and oceans just like it does today. Even today, a whopping 91% of plastic isn’t recycled. One may think why a Chinese fisherman dumping a plastic lunch box in the sea should bother a guy living on the east coast. However, the throwaway culture that began in the west has resulted in a worldwide food packaging waste problem. The fish and other sea animals consume this plastic which is highly likely to end up on your plate through the food chain. That’s why everyone needs to reduce food packaging waste, especially plastics, to keep our planet and ourselves healthy. The following 5 tips may come handy in this regard. It may sound obvious, but the excessive use of disposable plastic bags has become a real threat to the environment. We often see people accepting plastic bags that are used only once. According to the Surfrider Foundation, Europeans go through round 87 billion single-use plastic bags every year. 20 minutes is the average usage time for a plastic bag. However, it takes 400 years to decompose in nature. Often, littering of polyethylene bags clog drains in the rainy season, pollutes the soil, and causes animals to eat those and get choked to death. The most convenient alternative to this problem is BYOB which means “Bring Your Own Bag.” You can carry a cloth or jute bag before stepping out for shopping. They are easy to use, last longer, and are eco-friendly. Alternatively, you can also use an eco-friendly paper bags found in most grocery shops, departmental stores, and shopping malls. Saying no to plastic bags also involves saying no to produce-bags. For example, do you honestly need to have a plastic bag to carry a loaf of bread that is already wrapped in a plastic bag? While shopping, choose glass or paper packaging over plastic or Styrofoam packaging. Avoid buying foods packed in multiple layers of plastic. For example, instead of buying apples wrapped in a plastic sheet, you can purchase lose apples. You can also purchase items such as grains, lentils, veggies, dry foods, fish, poultry, and even meat in loose quantity to avoid plastic food packaging waste. Many local meat suppliers and butchers wrap freshly cut meat and fish in wax paper which is eco-friendly. Always make sure to buy eggs in molded pulp cartons which are prepared from recycled paper using egg carton machine. They are also biodegradable. If you are looking for long-term eco-friendly storage options, you can use air-tight glass jars and metal containers. If you have a garden or have the space to start one, you can start canning your own fresh produce to avoid the use of plastic food packaging. You can also use washable and reusable bags to store food and vegetables. Another good and practical idea is to carry your own container when buying a takeaway. For example, you can get your morning cup of Joe in a stainless steel travel mug and avoid using Styrofoam cups completely. Liquids such as milk, juices, and water can be filled in glass bottles. If you carry home-cooked lunch to the office every day, make sure to pack it in reusable containers. If you order a takeaway every day, you are probably using a lot of plastic cutlery. For an average lunch, you are likely to use at least a couple of plates, two sets of fork, knives, and spoons. Every year 6 million tons of disposable plastics such as spoons, forks, plates, and cups are discarded most of which ends up in our oceans. But if you were to switch to metal cutlery or silverware, you will be helping to bring down this Use and Throw culture. Start keeping a set of reusable cutlery in your desk drawer. You can also use paper plates or some other form of eco-friendly cutlery. There are even reusable pocket cutlery sets that you can carry around in a purse or a bag. When ordering food online, choose non-plastic food packaging if the option is available. Although you avoid plastic food packaging, you can’t avoid it completely. Non-recyclable plastic packaging is often used to pack meat and meat-based products which ultimately leads to pollution. One way to address this issue is to shift your diet from meat-based products to vegetables. It will not only help avoid the usage of non-biodegradable food packaging but also make you healthy. It will help reduce greenhouse gas emission as well. According to a recent study published in 2017, lower consumption of not only beef but also orange juice, pork, whole milk, and chicken has led to a 9% reduction in average American’s diet-related greenhouse gas emissions, dropping it from 1,932 kilograms in 2005 to 1,762 in 2014. The study also states that the biggest contributor to the reduction was a decline in beef consumption of about 19% over the course of the decade, adding up to a cumulative reduction of 185 million tons of climate change pollution. However, focusing on non-biodegradable waste shouldn’t mean that you can ignore biodegradable food packaging waste. Using glass jars and paper packaging is as important as its proper disposal. If possible, you should compost and recycle paper products, cardboard boxes, and discarded food in your backyard instead of dumping them in the regular garbage. If not, you can check for local recycling programs and not down the drop off and pick up locations. It is not possible to eliminate the use of non-biodegradable packaging completely. However, we can certainly reduce the amount of food packaging waste we throw out in the trash every day. Hopefully, these 5 tips will prove helpful for you in living an environmentally conscious lifestyle henceforth. As you can see, none of these tips are out of the ordinary. So, incorporating them into your present lifestyle shouldn’t be a problem. It is true, old habits die hard. But, you have to start somewhere. Take the first step to stop planet earth’s downfall and let us know how you did it.